Today a lot of people spent most of the day hitting F5 to see whether they got re-newed my Microsoft for another year as Microsoft Most Valuable Professional. 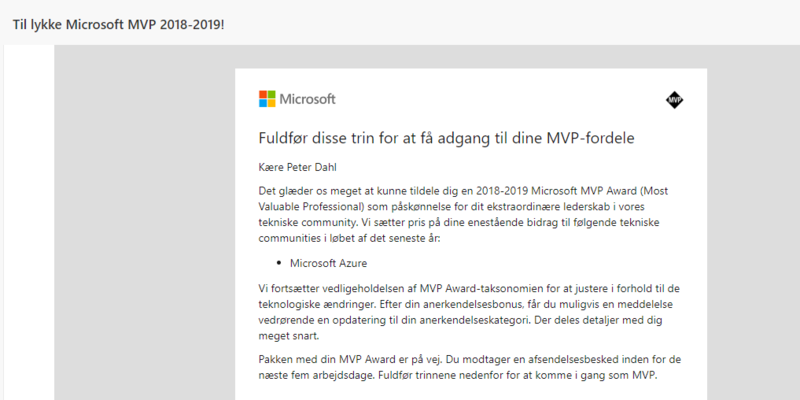 I have also been looking at my inbox today and fortunately I got the mail from Microsoft, I’m very proud and humble to annouce that I’ve been re-awarded with the 2018-2019 Microsoft Most Valuable Professional (MVP) award for Microsoft Azure. This is truly a great honor for me. I would like to thanks my family and friends that is very understanding for all the hours spent in front of the screen and all the days I’m travelling. Thanks to Microsoft community for giving me the opportunity share my knowledge and passion for Microsoft Azure.